Sometimes, ya just gotta throw a party and I did exactly that. An appetizer party, specifically. What inspired this? Mostly, the party issue of Bon Appetit. I vacillated wildly between wanting to host a huge shindig for everyone I know to having just a few people over for something fancy. I’ve done both and enjoy them equally, if differently. Eventually, I settled on a not-too-big appetizer party based on a couple of recipes from the BA magazine. The runaway hit of the dishes I made was the giant, creamy cheese ball coated in salty, savoury everything bagel spice. I doubled the original recipe – a good call considering how little was left at the end of the night. Because it was such a large ball o’ cheese, I found it was a lot easier to make a dome than a ball but with the original recipe, it should be much easier to shape. Also, I skipped the pancetta step for two reasons: 1. there were vegetarians coming to the party and I wanted them to be able to try this out and, 2. I had enough to do already, thank you very much. I have no doubt the pancetta is fantastic when included, but I was a busy girl. 1. Crisp pancetta in a sauce pan over medium heat for roughly 5-8 minutes. Remove from the pan and drain on paper towels. Set aside. 2. Blend together (in a food processor, with beaters, whatever you’ve got) the cheddar, cream cheese and butter until smooth. Add in the green onion, Worcestershire sauce, salt & pepper. 4. Just before you are ready to serve, cook the garlic in a small pan over medium, stirring often, until crisp and golden brown, about 3 minutes. Remove from the pan and drain on paper towels. 5. Add the shallots to the pan and, like the garlic, cook until golden brown, which will take 5-8 minutes. Make sure you stir often. Drain on paper towels and allow to cool. 6. Mix the sesame seeds, poppy seeds, shallots & garlic in shallow dish and roll the cheese ball until it’s coated. Serve with crackers and eat too much! New house, new kitchen, new recipes! Tried this one out last night and it was a whole pile of filling, healthy deliciousness. Definitely give it a whirl: it’s easily adaptable and pretty quick to make. J pickled the red onions and cucumbers that he served and it added a great sour bite to the sweet and spicy sauce that accompanies the dish. You could also serve the meatballs as an appetizer, serving the sauce on the side as a dip. 1. In a medium-sized bowl, combine all the meatball ingredients. Do not overmix. Refrigerate for anywhere from 2 – 24 hours. 2. Preheat your oven to 400F and line a baking sheet with foil. Dampen your hands and roll out roughly 16 meatballs. Bake 10 minutes. Remove the meatballs and preheat your broiler. Cook for 5 more minutes. 3. Meanwhile, if you plan to stir fry the veg, heat a pan with 2 ts of olive oil to medium and sauté for 4 -5 minutes. If you’re pickling them, however, you can skip this step. 4. In a small bowl, mix together the ingredients for the sauce. Adjust flavouring to taste – some people like it hot, some salty, some sweet. 5. 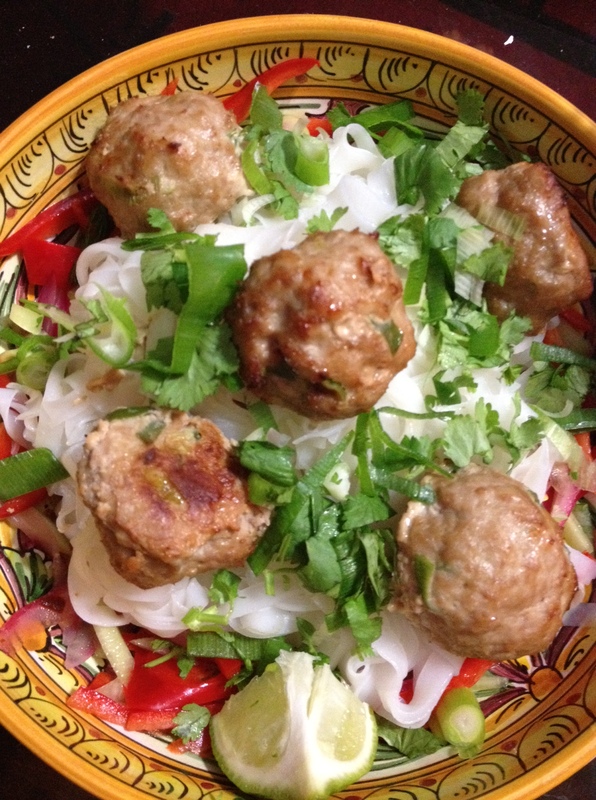 Place the noodles at the bottom of a bowl and layer in the vegetables and meatballs, topping with green onion, cilantro and a lime wedge for garnish. Either pour the sauce on top or serve on the side. Since it was a holiday here yesterday, the husband and I decided to put together a big, easy, fresh dinner. Popped into the market and found fresh Ontario corn, ciabatta bread, beautiful heirloom tomatoes and delicious, well-marbled steaks. The initial plan for the tomato was to simply slice and drizzle with a really good balsamic that we save for this kind of meal, sea salt and pepper. Since we had the ciabatta, though, I decided to make up a simple bruschetta. Good plan, lemme tell ya. 1. In a medium bowl, combine tomato, onion, parsley, olive oil, balsamic and pepper. Stir and allow to sit 10 – 15 minutes. 2. Slice ciabatta lengthwise and toast or place in a 350-degree oven to warm and crisp up for a few minutes. 3. Drizzle the bread with olive oil and add the salt to the tomato mixture. 4. Spoon the tomato mixture over the bun. The Awesome Brother brought these over on Christmas and they were snarfled up in seconds. Yes, snarfled. He tells me that they’re easy to make and I am happy to report that they are even easier to eat. They’re crunchy. They’re salty. They’re sweet. Believe me, you want them. 2. 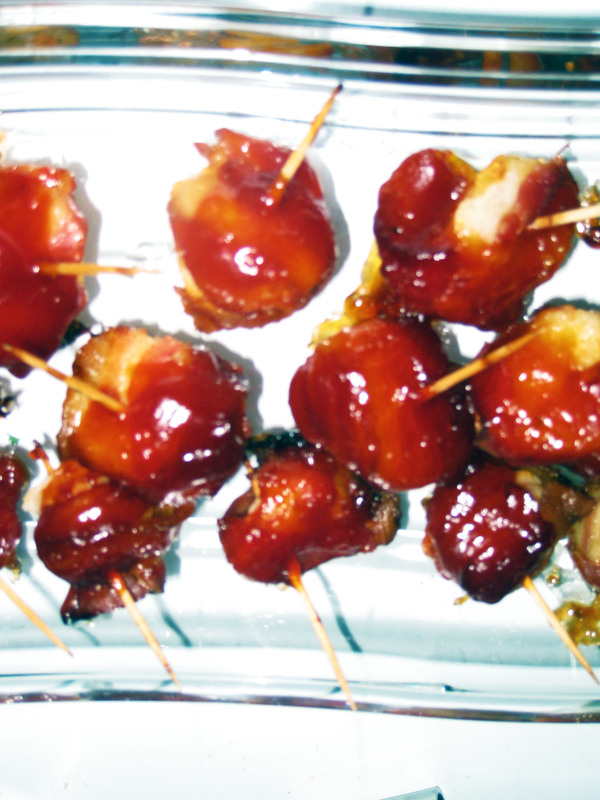 In a medium bowl, combine brown sugar, Worcestershire sauce, and ketchup. Marinate water chestnuts for roughly 2 hours in sauce. 3. Cut bacon in half lengthwise & wrap one slice around each chestnut. 4. Secure the bacon with a toothpick and arrange the water chestnut wraps in a large baking dish, leaving room between each chestnut. 5. Bake for 10 – 15 minutes. 6. Take the chestnuts out of the oven and drain off any excess fat from the bacon. Glaze with remaining sauce. 7. Return them to the oven for another 30-35 minutes until the bacon is crispy. J and I have been talking about making poppers for a while now and I decided it was time to get ’em done already! This recipe is good for the newly-minted, the curious and the well-indoctrinated with respect to heat tolerance. 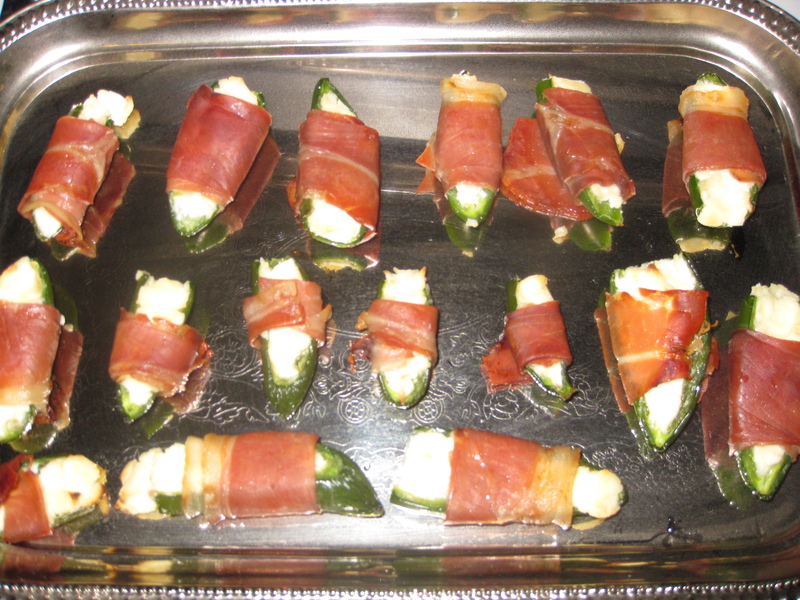 The heat from the peppers is balanced out nicely by the creaminess of the cheese and the saltiness of the prosciutto. Also, because they’re roasted, they lose some of their potency. While I do thoroughly enjoy the deep-fried version with a pint of whatever is on tap, this version is baked and…probably not something you’re gonna find at the pub. They are quickly made and just-as-quickly devoured in front of your eyes. 1. Preheat the oven to 400, with the rack in the middle. 4. Wrap the peppers with slices of prosciutto. You may need to slice the prosciutto to make it thinner, depending on the size of the jalapenos. 5. Place them on a foil-lined sheet and bake for 20 minutes. *you might want to wear latex gloves to handle the peppers. I used a spoon to get out the seeds & membranes, but I also washed my hands 18 times to ensure my finger tips wouldn’t burn for hours. I speak from experience….it’s not pleasant. Without fail, this is a major crowd-pleaser courtesy of Giada de Laurentiis. It makes enough for a full baguette, depending on how generous you are. I made this for a family dinner and it was a huge hit. I’ve been making it since and passing the recipe on. It will take about an hour a bit, but only because you need things to cool before you can work with them. 1 teaspoon red pepper flakes – this is just enough for a bit of heat. Feel free to add more! 1. Warm the broth and chili flakes in a medium pan over medium to high heat until it boils. Add the peas and cook roughly 5 minutes or less, til bright green. Drain the peas with a sieve, catching the flakes. 2. Place the peas, mint, salt & pepper in a food processor or hand blender. Process until smooth. Taste to make sure seasoning is where you want it. Cool for 30 minutes in the fridge. 3. Meanwhile, slice the baguette & preheat the oven to 375. 4. Place the baguette slices on a parchment paper-lined baking sheet in a single layer & bake for 10 minutes. 5. Drizzle the crostini with olive oil and rub with garlic cloves. 6. Whip the cream until stiff peaks form. Fold the cream into the pea puree. 7. 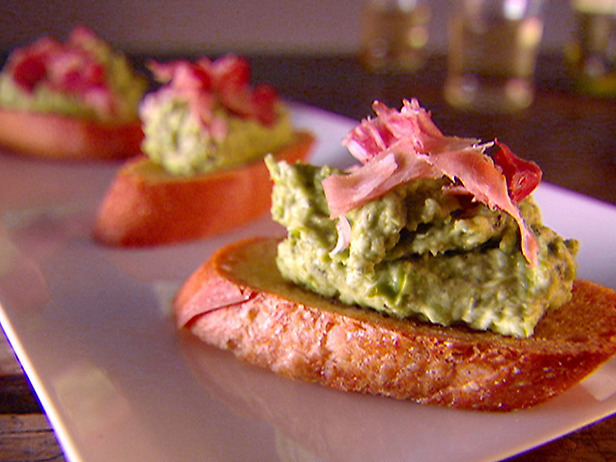 Top each crostini with a spoonful of the mixture and a few pieces of prosciutto.